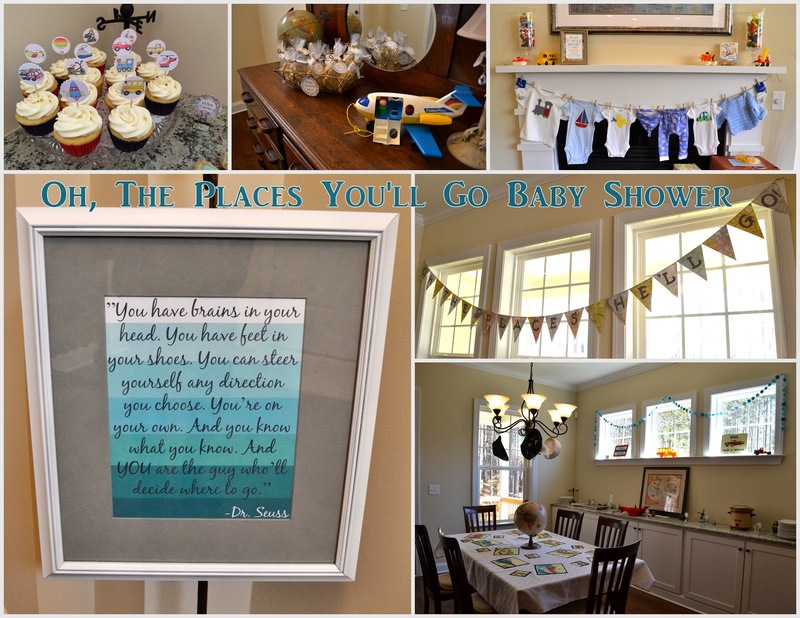 Last month, my mom and one of my best friends Katie threw me a baby shower here in Charlotte with the theme Oh The Places You'll Go. It was more travel inspired with just a touch of Dr. Seuss which I loved since we really love travelling and seeing new places and hope our little one will too. All of the decorations were perfect. My mom has a lot of travel decor (like the hats hanging from the kitchen light fixture) from living in different countries growing up in an army family. And she has lots of Little People travel themed toys like the airplane and bus and such that my sister and I played with as kids. She borrowed the globes and garland from me and made the table cloth and banner. She also made this diaper wreath with clip art travel stuff taped to it. She also made a pretend passport for the baby. We are hoping to cloth diaper but of course will always need a few disposables for when we travel and such. She printed the Dr. Seuss quote out and framed it. We are excited to hang it up in the nursery. Our little guy has a ton of cute appliqued and handmade onesies and such from the mantle. I'm loving the little hat and leggings with transportation stuff on them. There are a few more Little People toys on the mantle as well as random little toys in the two vases as decor. And a Oh the Places You'll Go Baby book to be read in utero from my sister. We've read it to munchkin several times and he seems to move around a lot and really like it! I took these two photos later that night so you could see the window decor and table cloth better because it was hard to capture on camera when it was so bright out. All the food was labelled for a different country to go along with the theme... so clever! The little food labels were made out of punched out maps and punched out white paper with the words printed on them and are attached to binder clips. My friend Elisabeth brought this activity that I was super excited about which I had seen at a friend's shower. Everyone puts their thumbprint on the printable (in the end it will look like a big bunch of balloons) and signs their name in their thumbprint. I can't wait to put this up in the nursery too! We played few fun shower games Katie came up with. One was matching the word "baby" in different languages and another was about what different things you have on your smart phone.. some was related to baby or kids and there were other categories like how many contacts you have with a "B". Much better than the measuring tape game or the candy in diaper game that I've heard of played at showers. And I opened gifts. Little guy has some super awesome stuff already! The wives from the group we usually hang out with. Katie and I... can you believe she co-hosted a shower when she was about 37 weeks pregnant. She is amazing! My friend Kelley brought her daughter Olivia who is seriously the best behaved almost 4-year old I've ever seen. She is so adorable too. I had such a wonderful shower and munchkin is already so spoiled and loved! Thank you mom and Katie for throwing the shower! I first made these food label stands for my sister in laws Duck Baby Shower. I wanted a way to label the different dishes and have those label be up high enough to easily see. All the stands I looked at online were kind of pricey so after some brainstorming with my mom, this is what I ended up with. Drill a hole in the top of each of your wooden pieces or have someone do this for you. You may also be able to buy some with holes already in them. Make sure the hole is big enough to fit your dowel in and it doesn't need to go all the way through the wood piece (just most of the way) but if it does that's not a big deal. Cut your dowels if necessary to the height you prefer. Mine are 12 inches but they can be a tad wobbly on a tablecloth and since I have big labels attached to the top so I think before I use them again I will shorten them by an inch or two. You will need two labels for each stand so one covers the back and one covers the front. Attach the two labels to the dowel and to each other using little pieces of rolled scotch tape. I found this to be the best thing for attaching and wouldn't be too hard to remove an entire label from a dowel later should you need to. This is also when you can add twine or ribbon or some other decoration if you wish. Then you can put your dowels with attached labels into your wood pieces and they are ready to be used! I have 12 of these on hand and they are great for showers, parties, and get togethers. They are great even for sometime simple like labeling which bowl of salsa is mild and which is medium or hot when you have guests over. I reused the stands for my friend's Cute As A Button Baby Shower as well. These could also be place settings or have lots of other labeling purposes! After we painted the nursery aqua, my dad went to work on the closet. 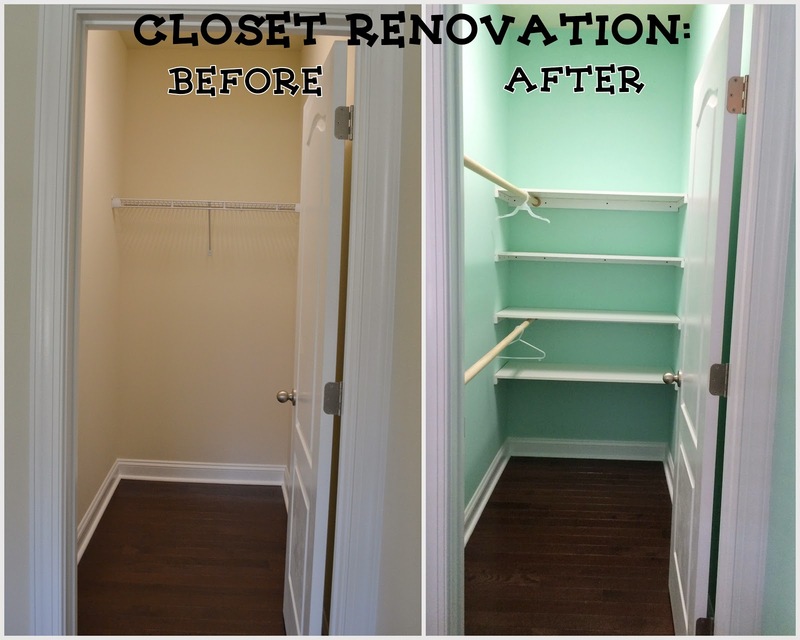 As you can see in the before photo, this closet is very narrow and having the hanging bar (or bars) at the back waste a lot of space. My dad has put in a lot of closet shelving before (like some storage shelves he and Eric did at our last home - this has more detail about the shelving) and I really like the way the shelves don't use brackets which also get in the way and waste space. The shelves were already painted wood from Lowes and the wood pieces that brace the shelves were painted white by my dad to match. The shelves are about 15 inches apart. The four shelves allow for so much storage and easy access. Plus there is space below the shelves to store things too. The rods on the very narrow wall on the right are able to accommodate baby and kids hangers with enough room but it would be a little too narrow for adult size hangers. They are 1 1/2 inch wood left natural and about 38 inches high (bottom rod) and 67 inches high (top rod). We could have painted these white too but that would have been more work and I think they look fine natural. This layout definitely makes the best use of the narrow closet space when needed for hanging clothes and storing items. Definitely an awesome upgrade from wire shelves and rod! Thanks dad!